You got those vases? Lucky you. 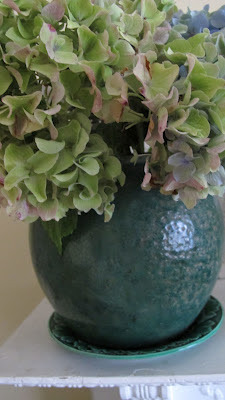 And everything, particularly "antiqued" hydrangeas look better on majolica. Lovely flowers. Enjoy your last day. Those vases are made for antiqued hydrangeas, and so is the majolica. I love your donkey fetish! I love it when hydrangeas do that - especially on the plant. They always do it better naturally than I can do it in the house. And they are lovely in the vases. I adore that color. Glad you had a nice vacation. Love the color variation in your hydrangea. So pretty. 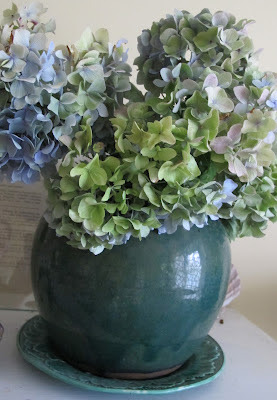 I love your hydrangeas (and the Majolica!) so pretty!!! Beautifully antiqued hydrangeas and looking gorgeous in those vases. Those hydrangeas are beautiful. And Opal sounds like a very lucky donkey! Love the beautiful "antigued" hydrangeas. I can hardly wait for ours to turn. So lovely! The hydrangeas are splendid in those vases. Hope your time back at work hasn't been too daunting following your holiday. I love it when hydrangeas 'antique' like these, they really are the most beautiful colour. Actually I still have some in a vase that antiqued and then dried while still looking full over the summer. Why is it that some hydrangeas do that and others inexplicably wilt and flop? Strange but lovely flowers!